Murphy’s own party colleague, junior minister Catherine Byrne, said that the plan “looked like overdevelopment”. HOUSING MINISTER EOGHAN Murphy has defended plans to put 470 new homes in Inchicore in Dublin. The plan for the regeneration of the St Michael’s Estate in Inchicore was unveiled today. The plan will see a new community constructed on land owned by Dublin County Council. Murphy’s own party colleague, junior minister Catherine Byrne, said that the plan “looked like overdevelopment” and called the plan a “bad day for the community”. The final mix of the new homes is yet to be decided, but is expected to include 140 homes classified as social housing and 330 other houses, mostly provided under a Cost Rental model. Under the cost rental scheme, housing is built ensure that rents are based on the cost of providing, financing, building, and maintaining the development, rather than to maximise profit. 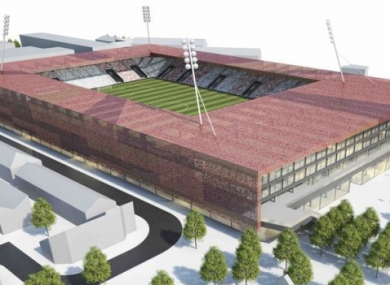 The scheme also means that a plan by local League of Ireland club St Patrick’s Athletic to build a new 12,000-seater stadium and 520 houses will not go ahead. Speaking to RTÉ’s Drivetime today, the club’s chairman Tom O’Mahony said that the club was disappointed. The ambitious St Pat’s scheme, which would see the bulk of the housing built on the club’s current Richmond Road ground, would include a new 12,000-seater stadium as part of the new community centre. O’Mahony said the club’s plan would deliver more housing and the plan to put the stadium above a local shopping centre was “tried and tested” around the world. He said that it was “disappointing that a more limited plan has been chosen”. Speaking on the same programme, Murphy said the Pat’s plan brought concerns about planning, finance and delivery of affordable housing. He said that the plan “looks like overdevelopment”, which was something he wanted to avoid. He said Byrne had been given a detailed briefing on the plan and he was hoping to prove to her that it could be achieved. It is not yet known when the public consultation process on the site will begin. Email “Eoghan Murphy defends St Michael's plan after colleague calls it 'overdevelopment'”. Feedback on “Eoghan Murphy defends St Michael's plan after colleague calls it 'overdevelopment'”.